Arles Aion – Mithraeum. Our Common Sun. Damaged whit marble statue. Mus�e lapidaire, Arles. Found in 1598. Dressed torso of a standing Aion, whose head and legs got lost. The two hands, which he presses against his breast and in which he probably held a key, are broken off. 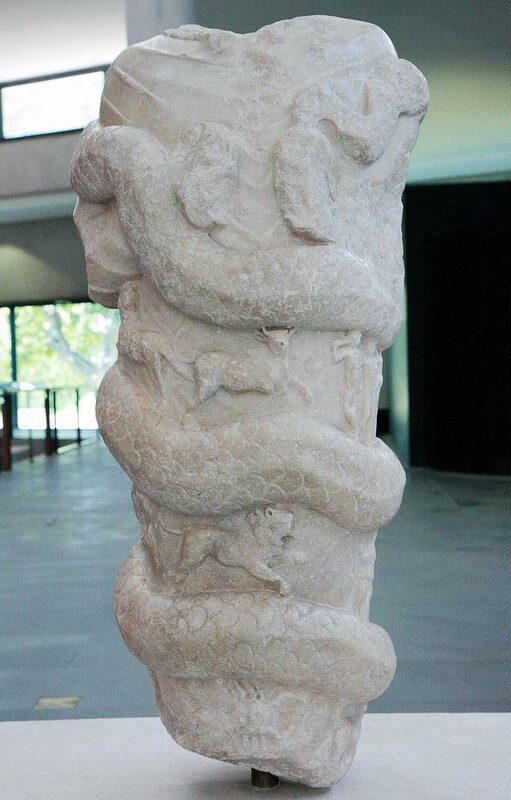 A serpent, winding itself in three coils round the god's body, rests its head on the god's breast. Between these coils in groups of three, the nine signs of Zodiac have been represented in a graceful way. Above from the left to the right: Aries-Taurus-Gemini embracing each other, the first of whom has a sceptre in the upraised r.h. and the other holds with his l.h. a lyre, resting on a base. In the centre : Cancer-Leo and Virgo in a long cloak, which covers the head. Further a youth with Libra-Scorpio-Centaurus. The three other signs Capricornus-Aquarius and Pisces got lost.